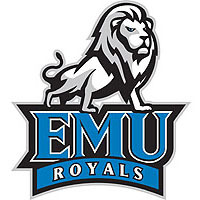 The EMU Runnin Royals played D-I James Madison University to a 37-37 draw in the first half, and were still within 53-50 midway through the second, before the Dukes pulled away for an 82-65 final. The Eastern Mennonite basketball men made a great showing in the meeting against their Division-1 neighbors before the mismatch on paper finally played out on the court. EMU shot 44.7% against the taller Dukes, and out-shot their hosts from three-point range, 34.4% (11-32) to 23.5% (4-17). The momentum-building performance should help the Royals as they head into the second half of their season, all Old Dominion Athletic Conference games. That momentum will get a quick test, as rival Bridgewater College (5-4/2-0 ODAC) visits Yoder Arena next Wednesday, with a 7:00pm start. Eastern Mennonite maintains a record of 6-5, as the contest against JMU is classified as an exhibition for the Royals. The Runnin Royals had a fantastic first half and took an early 3-2 lead when Isaiah Harris-Winn (Frederick, Md./St. Maria Goretti) hit a three pointer on their first possession. The rest of the frame turned into a contest of runs. JMU used a prolonged 10-0 streak to go up 16-6 which the Royals erased by getting back-to-back-to-back triples from Jerome Jones (Charles Town, W.V./Washington), RaShawn Latimer (Warrenton, Va./Kettle Run) and Harris-Winn, tying the score at 18-18. Jerome Jones nailed back-to-back threes later on, getting the men back within 27-26 with 5:36 left in the half. JMU then struck their second 10-0 run, blowing open a 37-26 margin, before the Runnin Royals caught fire to end the half, scoring the final 11 points. Jerome Jones hit his fourth trey of the half with six seconds left, earning Eastern Mennonite a 37-37 tie. The men were accomplishing their keys to game over the first 20 minutes, hitting 9-of-19 three pointers and fighting for a 14-14 draw on the battle for the boards. In the second half, James Madison took advantage of their height. Combined with EMU’s recent rash of injuries leaving them with no true post player in uniform, it was a challenge for the Royals to maintain their pace in the second half. The Dukes converted three straight layups to build a little space at 49-42, but the men hung around. Xavier McCants (Olney, Md./Sherwood) sliced to the hoop for two at the 11:22 mark, keeping EMU within 53-50, but James Madison answered with a quick 8-0 jab, all on layups, to open up a daunting 61-50 margin. After another 8-0 streak, the Dukes were up 73-54 with 4:15 to play, and the suddenly cold Royals couldn’t shoot their way back in. With their inside muscle, JMU out-rebounded the men 22-8 in the second half, finishing with a 36-22 margin. The Dukes also had a shooting edge of 54.2% to 44.7%. But Eastern Mennonite left with their heads high from their effort against a bigger, stronger and scholarship-filled team. Despite being hindered with foul trouble, Harris-Winn scored 16 points on 5-6 shooting, grabbing a team-best five rebounds. Jerome Jones finished with 16 points as well. Latimer was tagged for a pair of fouls in the first two minutes of the game, but still charted 14 points with three assists. Darryl Christian (Forest, Va./Brookville) matched his season total by scoring nine points, all in the first half. Maleke Jones (Charles Town, W.V./Washington) dished out four assists. Paulius Satkus topped JMU with a career high 22 points and six rebounds. Kent Jackson scored 17 and back-up big man Ivan Lukic had 10 points and eight boards.